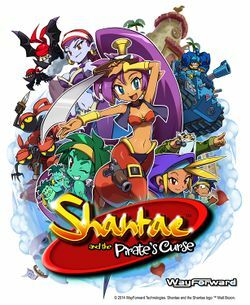 Shantae and the Pirate's Curse is a platformer by WayForward Technologies and Inti Creates for the 3DS, Wii U, Xbox One, and PlayStation 4. It is the third game in the Shantae series, following Shantae: Risky's Revenge, and was released on the Nintendo eShop on October 23, 2014. The game was announced in the November 2012 edition of Nintendo Power. A fourth entry in the series, Shantae: Half-Genie Hero, is already in development. Following the events of Shantae: Risky's Revenge, in which the half-genie girl Shantae was forced to defeat the embodiment of her own powers, Shantae has been adjusting to a life without genie powers. However, one day, Shantae is approached by her old nemesis, Risky Boots, who informs her that the Pirate Master, a powerful evil tyrant who was sealed away long ago by the genies of Sequin Land, was preparing to return and spell doom for all of Sequin Land. Despite not having her powers, Shantae strikes up a reluctant alliance with Risky to thwart the Pirate Master's revival. This page was last edited on 30 May 2016, at 13:53. This page has been accessed 51,947 times.